As well as futures contracts, we offer a wide range of options on futures. These include American, European, Asian (APO), calendar spread (CSO) and ARB options for crude and refined products. 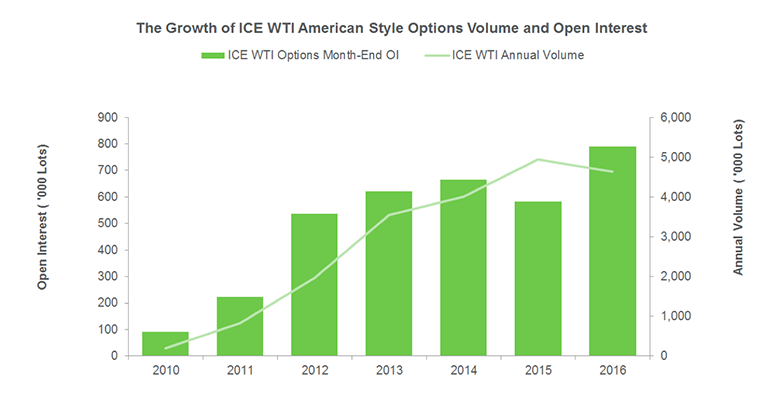 Trading activity in our range of oil options contracts has increased in recent years as users adopt options strategies to hedge their price risk. Use the interactive map below to explore our global range of oil options. Use the links below to explore our global range of oil options. WTI: Same as the CME. Currently 4:30pm EST. Please refer to section N.5 of the Rulebook for further details. We suggest asking your clearer if they have an earlier cut off than these times to allow them to accommodate all their customer instructions. ICE will endeavour to publicize assignments within15 minutes after the declaration window is closed. Expiry reports are made available on our reporting website for members with positions. Customers should speak with their clearing firms for the results. ICE Clear Europe also sends out notifications over the Clearing systems that the contract has expired and the results are available, along with the reference prices. ICE Operations Settlements Team: +44 (0)20 7065 7600 or the helpdesk: +00 1 770 738 2101, after 7:00pm London time.